During the summer, your go-to mani and pedi shades are likely bright pinks and oranges, crisp whites and sparkly ocean-esque blues and greens. Come fall, though, it's time to experiment with different nail polish colors. This season, there are quite a few gorgeous hues that top nail artists say will be in high demand. Jeffrey Rivera, lead manicurist at Glosslab, says bold berries are one of his favorite nail polish trends this season. "Vampy shades always make a comeback this time of year, which I love," he says. "Berry tones are fantastic because they are flattering with every skin tone and, while the shades are darker, they’re still a lot of fun." Reina Santos, nail artist with LeChat, says fall is the perfect time of year to embrace rich deep shades, like Bordeaux and burgundy, as well as fall-inspired colors like pumpkin. Anastasiia Morozova, nail artist for LeChat, adds that pumpkin-inspired oranges are great to wear around Halloween. Rivera also says dusty pinks and purples will be huge. "Summer’s all about bright and bold colors, but fall's tones are more muted," he says. "I’m loving all the new shades of pinks and purples that have grey undertones, giving you an almost ashy finish to the color. These colors are great for complementing your fall wardrobe without overpowering your look." Not ready to shelve your bright nail polishes? You don't have to! "Autumn is a colorful season and I don’t shy away from bright shades even though summer has passed," says Morozova. Look for hues that remind you of spiced cider and colorful flowers and leaves. Meanwhile, Sarah Bland, Smith & Cult beauty advisor, says gray will always be a fall trend. Finally, don't be afraid to break out the black polish like you did in high school. "There were so many cool, punk-rock black nails on the runways for the Fall 2018 season," says Rivera. 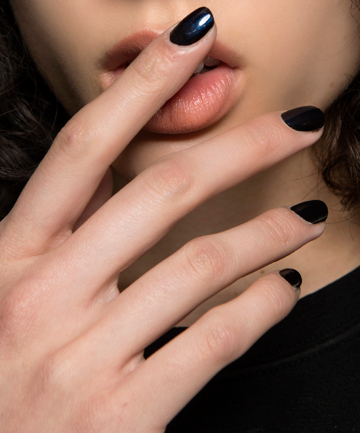 "You can wear black nails glossy for a look that’s super-glam and done up." Keep reading for 10 nail polishes our experts say you should try now.